Monica is an Angel Therapy Practitioner® certified by Doreen Virtue, Ph.D. Dr. Virtue is a psychotherapist, an Internationally acclaimed teacher and author and creator of the Angel Therapy® Practitioner’s course. Dr. Virtue’s Angel Therapy® Practitioner’s certification allows Monica to provide Angel Readings, spiritual counseling and to use healing techniques as taught to her by Dr. Virtue in Laguna Beach, California. Angel Readings frequently validate guidance you’ve already received through your intuition. A reading often begins the process of you learning to communicate with the angels yourself. Angels help everyone whether we practice any form of religion or not. They are non-denominational in purpose; however, the Law of Free Will necessitates that we ask for their help. For further information about Doreen Virtue and her teachings, please see www.angeltherapy.com. When I do an Angel Reading I begin with a short oracle session to determine if there is a specific Archangel or Ascended Master that I should call in for your reading to be there alongside your own guides and guardian angels. Then, I use oracle cards, clairsentience, clairvoyance, clairaudience and claircognizance to receive your important life messages and relay them to you either in person or by telephone reading. Depending on your own needs a reading might also include etheric cord cutting, psychic vacuuming and/or chakra scanning and balancing. Spiritual counseling often includes advice on ways to protect yourself with psychic shielding and how to release negative energy. I am also able to access the Akashic Records. 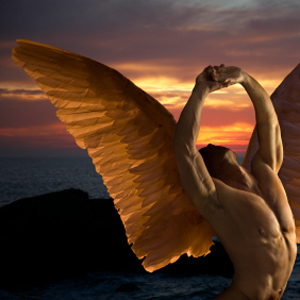 Angel Healing Sessions are not a substitute for psychotherapy or traditional medicine. Telephone, Skype and email Readings are pre-paid by E-Transfer, moneygram or snail mail. Is it Possible to Speak with Angels? “I had the pleasure of meeting Monica through my best friend who has a large energetic aura about her; they first met randomly but not accidentally on a train… A few months later, when I was visiting from overseas, we decided to take another 6 hours train ride for an angel’s reading together. The meeting revealed much about my life, amazingly channeled through a special person who is truly a great translator between our protector angels and us. I strongly recommend the experience to anyone that is striving to feel more connected to their inner self and at the same time interested in learning more about themselves now and in the future, so that they can be protected even in the smallest ways.